Heat oven to 400°F. Place pita breads in ungreased jelly roll pan, 15 1/2x10 1/2x1 inch. 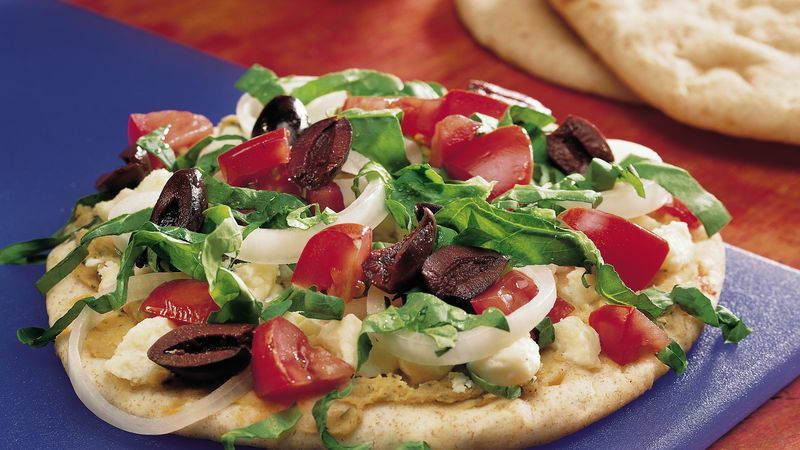 You can use 4 ready-to-serve pizza crusts (6 inches in diameter) instead of the pita breads. Sprinkle 1 to 2 tablespoons chopped cooked chicken over the hummus on each pita. Greek in origin, tangy feta cheese is traditionally made from sheep or goat milk. It is sometimes referred to as "pickled" cheese because it is cured and stored in its own salty whey brine.